This document describes the RIPE Policy Development Process (RIPE PDP), outlining how policies relating to the operation of the Internet are developed by and for the RIPE community. These four phases are detailed below with timelines. They are proposed deadlines for the various stages. 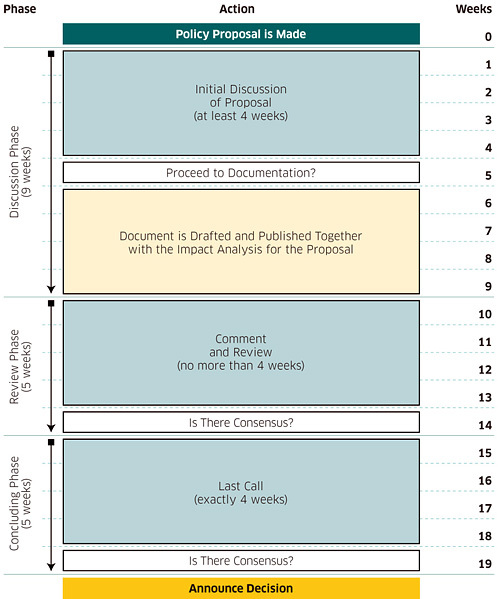 Individual proposals may choose to vary these, but the actual timescales must be documented. If the WG chair determines that the WG has reached consensus at the end of the Review Phase, the WG chair moves the proposal to a “Last Call for Comments” and the Concluding Phase starts. The Last Call period lasts four weeks. The Last Call announcement is also posted to the WG mailing list and to the Policy Announce Mailing List (policy-announce _at_ ripe _dot_ net). At the end of the Last Call period, all RIPE WG chairs as a group will evaluate the feedback received during this period and decide whether consensus has been achieved. If there is no feedback from the community at this stage, this is likely to be regarded as consensus and it will mean the previous call of rough consensus from the relevant WG chair at the end of the Review Phase still holds. If consensus has been achieved, the RIPE NCC will announce the decision of the RIPE WG chairs and, if necessary, implement the policy. If consensus has not been achieved, the RIPE WG chairs can decide to either withdraw the proposal or send it back to one of the previous phases. The proposer (or anyone else) is free to return the proposal to the WG for further discussion. NOTE: The actual timelines of individual proposals may vary. They are documented and announced per proposal. This document specifies the procedures that shall be followed to deal with disputes regarding the PDP. In each of the situations described in Section 3 of this appendix, the action being appealed is the decision to declare consensus or lack of consensus. One cannot appeal the merits of the policy proposal itself or its technical, political or legal grounds. These issues must be addressed in the PDP phases and should be taken into account by community members during discussion of the proposal. For the purpose of this document, the term "working group chairs collective" refers to the chairs and co-chairs of all current RIPE Working Groups, not including the current RIPE Chair. For the purpose of this document, the term "working group chair(s)" refers to the current chair and co-chairs of a working group. If, during the Discussion Phase, a community member believes that their views have not been adequately considered, their first action should be to raise the issue with the working group chair(s) for consideration. If the dispute cannot be resolved with the working group chair(s), the matter shall be brought to the attention of the working group chairs collective, which will vote for or against upholding the decision made by the working group chair(s). The relevant working group chair(s) shall recuse themselves from any related discussion within the working group chairs collective. The decision by the working group chairs collective shall be final in relation to the appeal. However, the matter can always be brought back to the working group for consideration. If a community member believes that the working group chair(s) have erred in their judgement when declaring consensus or lack of consensus at the end of the Review Phase, they should first raise the matter with the working group chair(s). If the dispute cannot be resolved by the decision of the working group chairs collective, the issue should be brought to the RIPE Chair. The decision of the RIPE Chair will be final. If a community member believes that the working group chairs collective has erred in their judgement regarding consensus in the Concluding Phase Last Call, they should bring the issue to the attention of the RIPE Chair. The decision of the RIPE Chair will be final. All appeals should include a detailed and specific description of the issues and clearly outline the decision being appealed. An appeal must be submitted no later than four weeks after a decision has been made. Working group chair(s) that are involved in an appeal should not be part of any discussion regarding that appeal in the working group chairs collective.